We DELIVER to Fairbanks & Ft. Wainwright! These breakfasts are served with your choice of home fried potatoes or hash browns and toast. Sourdough, oatnut, rye, or homemade white, wheat or 8 grain toast, English muffin, or biscuit. Homemade corn beef cooked and diced then mixed with hashbrown potatoes, onions and grilled. Our prime rib, lightly breaded and golden fried then covered with sausage gravy. Our cinnamon roll cut in half, dipped in egg batter, grilled and dusted in powdered sugar. We stuff our cinnamon roll halves with cream cheese, grilled and topped with strawberries and whip cream. Omelettes and skillets are served with three farm fresh eggs, home fries and your choice of toast. Sourdough, oatnut, rye, or homemade white, wheat or 8 grain toast, English muffin, or biscuit. Served with two farm fresh eggs, two pancakes or waffle, and your choice of ham, thick sliced bacon or link sausage. Two slices French toast, two fresh eggs and your choice of ham, thick sliced bacon or link sausage. *18% Gratuity will be added to parties of 8 or more. Our 1/2 lb. burgers are certified angus beef. They’re served on a homemade bun with lettuce, tomato, onion, pickle and mayo. Served with choice of fries, potato salad, soup, or green salad. Don’t forget about our homemade desserts! Made thick with beef and vegetables. Fresh veggies in a light red stock. Ask your server what the chef has prepared today. 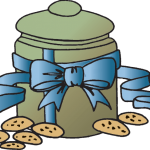 Look for the cookie jar icon to see items also available for lunch. Salads with a fresh homemade roll and butter. Bread choice: sourdough, oatnut, or rye, homemade white, wheat or whole grain. Served with tomato, lettuce, mayonnaise, and cheese. Beef – It is What’s For Dinner! Dinners are served with your choice of soup or side salad, baked potato or mashed potatoes with beef gravy and fresh sautéed vegetables. Homemade fresh dinner rolls and butter are also served. Served with your choice of soup or side salad. simmered in beef gravy and topped with sour cream. Italian sausage, tangy homemade marinara, and three kinds of cheese run four layers deep. Baked until bubbly. Fresh sautéed vegetables layered with marinara, lasagna noodles and three different kinds of cheese. Parmesan, golden fried and topped with Marinara and more Parmesan. Served with garlic bread and your choice of soup or side salad. Tender slices of chicken sautéed in butter, white wine, garlic onions, and fresh mushrooms. On homemade bread with mild cheddar. Homemade bread filled with crunchy peanut butter and raspberry preserves. Yummy with ranch or BBQ sauce! Angel food cake in a sweet brandy pudding that forms the cake layer frosted with real whipped cream and served with raspberry purée sauce! Is the name but superior to all others in taste! Hand-dipped ice cream blended with half & half and topped with whipped cream. We have offered a full espresso bar since 1994. In addition, we now offer Spiced Chai and Teas by Sipping Streams.